This rare, near infrared image shows a Super-Jupiter object of the κ And κ ("Kappa Andromedae") system –a very young star, with an estimated age of 30 million years (our Sun, for comparison, is around 5 billion years old) generated from data collected in July 2012 with the Subaru Telescope in Hawaii. Almost all of the light of the host star, on which the image is centered, has been removed through image processing; the host star is covered by the dark, software-generated disk in the center. κ And is a very young star, with an estimated age of 30 million years (our Sun, for comparison, is around 5 billion years old). The Super-Jupiter κ And b is clearly visible to the upper left. It has a projected separation of 1.8 times the distance between Neptune and the Sun. The gas giant has a mass about 13 times that of Jupiter, while the host star has a mass 2.5 times that of the Sun. There are strong indications that this planet formed in a manner similar to ordinary, lower-mass exoplanets: in a "protoplanetary disk" of gas and dust that surrounded the newborn star. This makes the planet an important test case for current models of planet formation and their predictions about planets around massive stars. Of the nearly 850 exoplanets – planets orbiting stars other than the Sun –currently known, only a fraction have been captured in actual astronomical images. The vast majority of detections rely on indirect methods. The reason for this discrepancy: stars are much brighter than their planets (typically by a factor of a billion or more); using traditional observational techniques, the planet will be hidden in the glare of its host star. 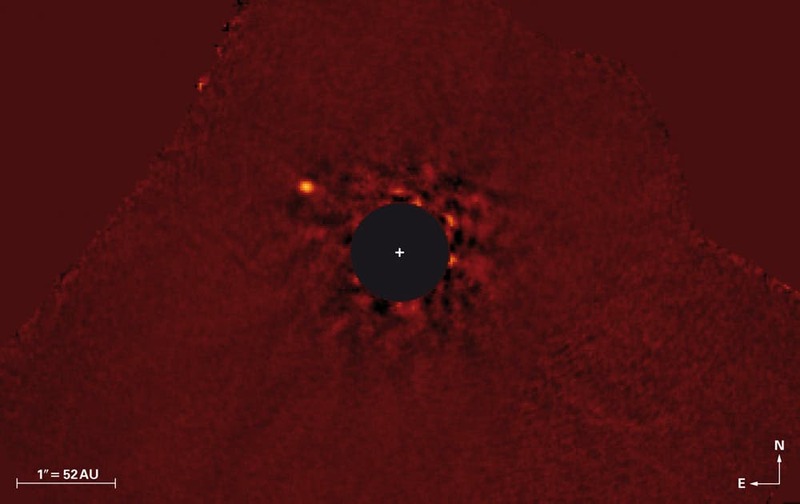 Now, a research team led by Joseph Carson (College of Charleston and Max Planck Institute for Astronomy) has managed to obtain an image of a large "Super-Jupiter" around the massive star κ And ("kappa Andromedae"). Their discovery makes use of the Subaru 8-meter telescope on the summit of Mauna Kea in Hawai'i, operated by the National Astronomical Observatory of Japan. Obtaining an image of its companion κ And b required advanced techniques both for observation and for image analysis. A particular challenge was that the orbit of the newly detected object is only somewhat larger than that of Neptune – most planetary images have been obtained for planets in significantly larger orbits. With a mass of about 13 times that of Jupiter, the object, called κ And b ("Kappa Andromedae b"), could be either a planet or a very lightweight "brown dwarf", an object that is intermediate between planets and stars. Circumstantial evidence indicates that it is likely to be a planet. An interesting aspect of the new Super-Jupiter is that it orbits a fairly young star, and at a distance comparable to planetary orbits within our own Solar System. Taken together, this is a strong indication that the planet formed in a manner similar to that of lower mass planets: within a primordial, "protoplanetary" disk of gas and dusk which surrounded the star during its earliest stages. In recent years, observers and theoreticians have argued that large, massive stars like this are more likely to have large planets than smaller stars such as our Sun. Yet there have also been concerns: massive young stars emit enormous amounts of high-energy radiation. This radiation could dissipate parts of the protoplanetary disk, which would in turn disrupt planet formation. The discovery of the Super-Jupiter κ And b suggests that stars as massive as 2.5 solar masses are still fully capable of producing planets within their primordial circumstellar disks – key information for researchers working on models of planet formation. A key advantage of direct exoplanet detection is the target's immediate accessibility for follow-up examination by traditional astronomical techniques, such as an in-depth analysis of its light by spectroscopy. This is the aim of ongoing observations of the light emitted by κ And b across a broad range of wavelengths. The ongoing observations will lead to a better understanding of the gas giant's atmospheric chemistry, and yield more precise information about the object's orbit and the possible presence of additional planets.